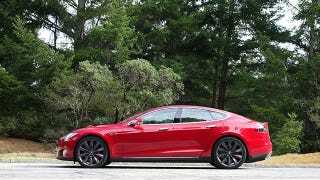 The Tesla Model S P85D is already capable of doing 0-60 MPH in 3.2 seconds, but now Elon Musk is promising a software update that will drop that down by a tenth of a second. Because why the hell not? According to Musk, an over-the-air update is going to be pushed out to the select few P85D owners out there because the acceleration in Insane mode was simply a byproduct of increasing traction in the snow. No word on when it's going to be pushed out, but having flogged the P85D for the last few days, I can't imagine how Tesla left anything on the table. And Musk says they're working on a similar update for the former range-topping P85 Model S, too.